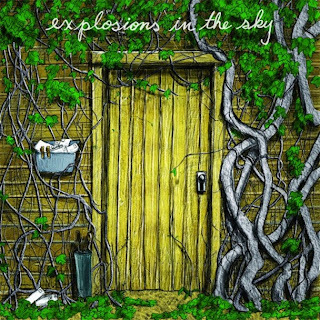 The first full-length release we've seen from the Texas-based project since All Of The Sudden I Miss Everyone back in 2007, Explosions In The Sky takes a step into the new decade by releasing Take Care, Take Care, Take Care, which mixes much of the more familiar sounds in the discography with the newer, more experimental tastes. The first track off the record, "Last Known Surroundings", starts with an ethereal and mysterious void, slowly shaping until a guitar hit brings the song forward motion with a drum beat that The Arcade Fire could say sounds familiar (No Cars Go, anyone?). After riffing with a sweetly tuned, high-octave guitar, the tune dies down into the bridge, a soft push that leads to a stronger buildup, gaining more and more strength and soul with a faster drum beat, until the cathartic release with a distorted guitar occurs, and the song fades back down to the void. The ending of "Last Known Surroundings" leads into "Human Qualities", which is a musical inner reflection, taking the same shape as the ethereal void of the beginning track for about half the song, before building up more and more towards a smaller emotional response, which then leads into "Trembling Hands", a nervous and quickly paced meshing of soulful chords and an articulate drum beat, speaking much in its short run-time with a sort of trade off between the drums and guitar, until they both finally start playing their hearts out in an ending jam that ends on a delectably sweet major chord. "Postcard From 1952" was an interesting piece to throw in right before the ending tune, "Let Me Back In"; it has similar aspects of sound that were presented in "Human Qualities", but makes the listener really think about what's being portrayed. The chords bring some joyful, retrospective quality along with them, making the ambiance undeniably and comfortably cheerful, but both before and after this mood is introduced, there is some melancholy introspection introduced, with some minor chords, slight effects, and slow, soft strumming from a background guitarist. The way the song is shaped is truly evocative of the quality of music represented by the album. Overall, Take Care, Take Care, Take Care was a fantastic listen. So long had we been awaiting a new album from one of the biggest names in post-rock, and disappoint they did not. The album, and each individual song listed, have been very well orchestrated and compiled for much less of a listen than a physical, emotional, and musical experience. So Take Care, Take Care, Take Care. You can pick up a copy of the album at the band's very own site here.